WTI and Brent rallied on Monday and Tuesday, ahead of the API inventories report as traders grew more concerned that sanctions on Iran can have a strong impact on global crude supply. 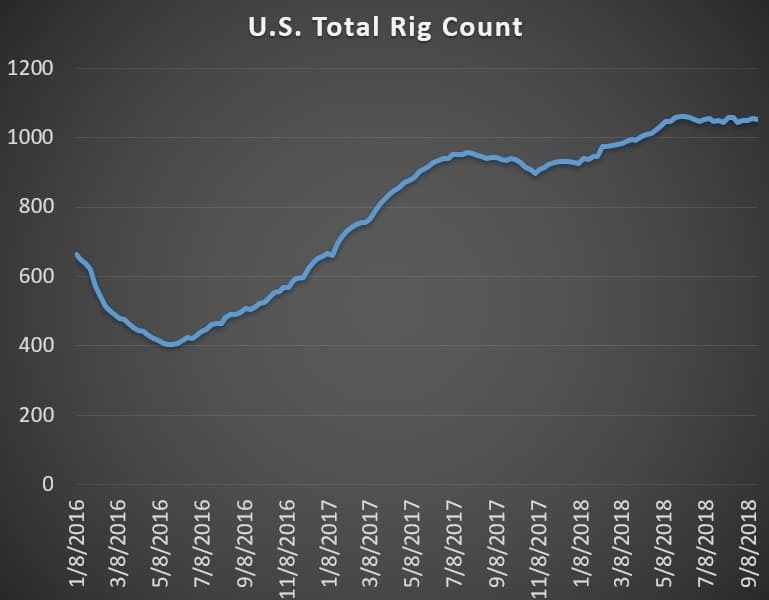 - The U.S. exported 913,000 bpd of gasoline in the first half of 2018, an increase of 144,000 bpd over the same period in 2017, according to the EIA. 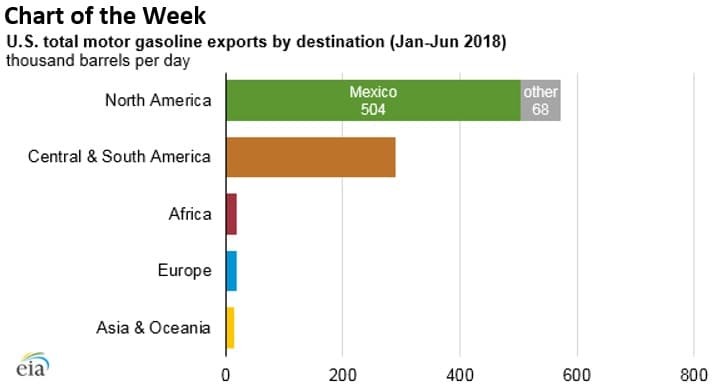 - Mexico accounted for more than half of those shipments at 504,000 bpd. - Mexico’s refineries are operating at low levels as they age and fall apart, forcing higher levels of imports from the United States. One of top priorities of Mexican president-elect Andres Manuel Lopez Obrador is to breathe new life into Mexico’s downstream sector in order to eliminate import dependence on the U.S., although it will come with a hefty price tag. • Shareholders of Marathon Petroleum (NYSE: MPC) and Andeavor (NYSE: ANDV) have agreed to move forward with a merger, which will establish the largest U.S. oil refiner. • The Sunrise oil pipeline, owned by Plains All American (PAA, PAGP), will begin operations on its expansion on November 1. The pipeline will help ease the midstream bottleneck in West Texas, adding takeaway capacity and likely reducing discounts for Midland crude. The expansion means the pipeline will eventually be able to handle 500,000 bpd of capacity, but it was not clear how much will be available in November. Oil prices burst out of the gates on Monday with strong gains, pushing WTI over $70 and Brent over $80 per barrel. Over the weekend, OPEC+ decided to take no further action to increase production even as Iran continues to lose supply at a torrid pace. Saudi Arabia said it would likely increase output in October but declined to offer specifics. The inaction was met with fears of a supply crunch from the market, pushing Brent up to its highest level in years. A growing number of analysts see higher prices as likely, perhaps even as high as $100 per barrel. Europe to establish Iran workaround. The European Union said on Monday that it would setup a special financial vehicle to allow Iran to evade U.S. sanctions. The “special purpose vehicle” would allow European companies to continue to do business with Iran while insulating them from the wrath of the U.S. Treasury. The announcement comes as U.S. President Trump will address the UN General Assembly this week, and the EU decision will put the two sides at odds. Iran’s oil supply losses are mounting, and it is unclear to what extent the EU financial vehicle will stem the tide. Oil majors agree to reduce methane emissions. A group of the world’s largest oil companies agreed to lower methane emissions from their operations over the coming years. The Oil and Gas Climate Initiative (OGCI) calls for a reduction of methane emissions by a fifth by 2025. ExxonMobil (NYSE: XOM) and Chevron (NYSE: CVX) recently joined the initiative and said they would limit methane emissions to 0.25 percent of total production, compared to 0.32 percent in 2017. The OGCI pledge calls for a reduction to 0.20 percent. The OGCI consists of companies accounting for a third of global oil and gas production, and includes BP (NYSE: BP), Royal Dutch Shell (NYSE: RDS.A), Total (NYSE: TOT) and national oil companies in China, Mexico, Brazil and Saudi Arabia. Easing of U.S. methane rules boosts marginal wells. The Trump administration is in the midst of rolling back limits on methane emissions from the oil and gas industry, a move that could boost small marginal wells. Stripper wells, which produce less than 15 barrels of oil equivalent per day, could be one of the biggest beneficiaries from the deregulation, according to S&P Global Platts. While miniscule on their own, stripper wells collectively account for around 10 percent of U.S. oil production. Related: What Will Trigger The Next Oil Price Crash? 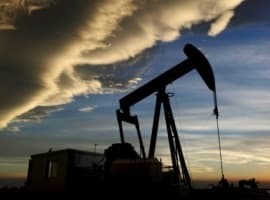 U.S. oil exports to China hit by trade war. China has declined to put tariffs on U.S. crude, but the trend of escalating purchases could come to an end anyway. Unipec, the trading unit of state-owned Sinopec, has reportedly shelved plans to increase oil imports from the United States due to the trade war. Bloomberg reports that Unipec had planned to increase imports to 500,000 bpd next year, up from an average of 300,000 bpd year-to-date. Permian natural gas discounts widen. Prices for natural gas from the Permian plunged to new lows last week. 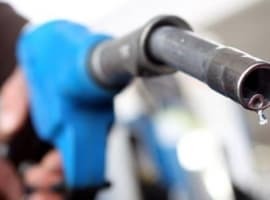 Gas prices at the Waha hub in West Texas dropped to a record low $0.61/MMBtu, losing $1.06/MMBtu in a single day, according to Natural Gas Intelligence. Prices rebounded somewhat at the end of last week, but the underlying dynamic that is crushing prices has not changed. Pipeline constraints have meant that takeaway capacity has been essentially fully utilized for the last few months. However, news that Southern California Gas Co., a major buyer of Texas gas, had nearly filled its storage tanks, raised new fears of reduced purchases. The result could be a worsening glut of gas trapped in the Permian. Keystone XL clears hurdle, could begin construction in 2019. The U.S. State Department issued another environmental review in response to a federal judge ruling from this summer, potentially clearing the way for the project to move forward. A spokesman for TransCanada (NYSE: TRP) said that construction could begin next year. Trump admin weakens oil-by-rail regulations. The Pipeline and Hazardous Materials Safety Administration (PHMSA) finalized a rule change on Monday, no longer requiring rail companies that carry crude oil or other flammable material to install electronically controlled brakes intended to reduce derailments. 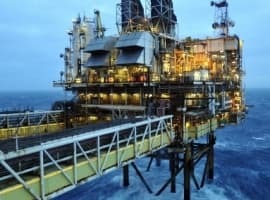 WoodMac: Oil market in danger of long-term supply crunch. Wood Mackenzie said in a new report that upstream development is too sparse to satisfy demand in the years ahead. A lack of spending, new FIDs, and new discoveries spell trouble. “A supply gap opens up in the mid-2020s, reaching 3 million b/d by 2030, 7 million b/d by 2035 and a formidable 12 million b/d by 2040. Barring technology breakthrough beyond what we already assume, we’ll need new oil discoveries,” WoodMac said. Mexico considers state-owned natural gas company. Mexico is weighing the creation of a state-owned company dedicated to upstream production of natural gas. The new company would receive all the non-associated gas assets currently under Pemex’s control.